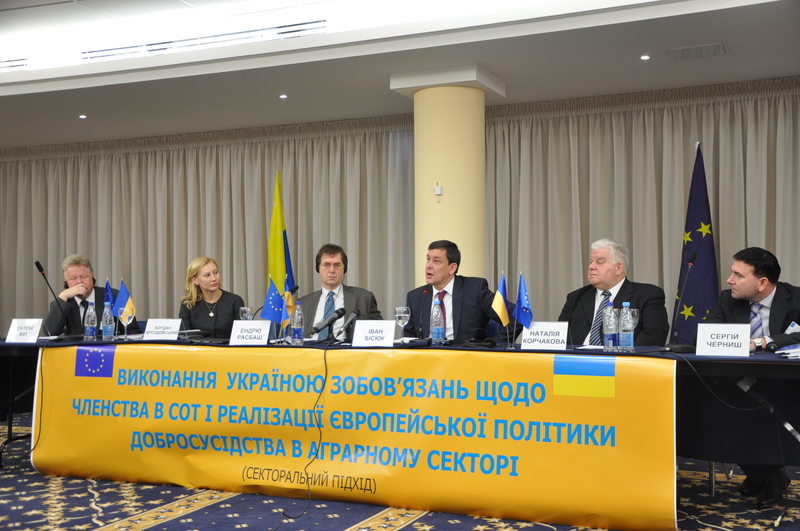 The prospect of joining a free trade area with the EU holds great promise for the Ukrainian agricultural sector. In order to maximize the benefits of these open doors, Ukraine’s long-term agriculture strategy should aim to ensure food security, sustainable production and rural employment. The EU is helping Ukraine work toward those goals through the ENPARD programme, part of the EU’s commitment to growth and stability in its neighbourhood. more than two years of work on Dec. 7 in Kiev. “A lot has changed during the four years since the project has started,” underlined Tony Wheale, a food safety expert. “Ukraine has moved very far forward in developing a modern food safety control system based on the principles of food safety ‘from farm to fork’,” he explained. With its €4.7 million budget, the programme enabled close cooperation between experts from Ukraine’s agriculture ministry and their EU counterparts in institutional development, food safety, market infrastructure development and rural development. According to Ivan Bisyuk, the Ukrainian first deputy minister of agrarian policy and food, further development of agriculture and rural territories is one of the central elements of the EU-Ukraine Association Agreement. “The agro-industrial complex is a very significant sector of the Ukrainian economy and it forms 17 per cent of country’s GDP,” explained Bisyuk. Experts agreed that progress has been made in bringing Ukrainian policies and laws around agriculture and rural area development closer to those of the EU. Bohdan Drozdovskyi, team leader of the project, explained how this progress has opened up more possibilities for exporting Ukrainian food to EU countries. He also emphasised the growing number of Ukrainian enterprises that use a systematic food safety control system to identify and control hazards. Sergey Chernysh, a key rural development expert, explained how project experts helped prepare the “National Concept for Sustainable Rural Development for the period 2020,”which was approved by the Ukrainian Cabinet. The strategy they developed based on the national concept should improve the competiveness of the Ukrainian agricultural sector, diversify the rural economy, reduce rural poverty, protect rural environments and develop rural communities. The Ukrainian Parliament has approved a number of laws prepared under the guidance of the project experts, including the law on agricultural wholesale markets and the law on agricultural service cooperatives. The EU-funded project, Implementation of Ukraine’s Commitments under WTO and ENP Frameworks in the Rural Sector (Sector-Wide Approach), supports Ukraine in fulfilling its commitments to the WTO regarding changes to its agrarian sector. The project’s objective is to promote close collaboration between Ukraine and the EU and harmonisation of Ukrainian agrarian sector standards with WTO requirements.